When autumn rolls around, it's a good time to grab a sweater, a warm spicy beverage, and some stitching! This embroidery pattern is the perfect way to celebrate the season. Enjoy the crisp breeze while you're stitching, then display it through the rest of the fall. The lettering is reminiscent of the calligraphic brush art that you'll frequently see in wall art and the tiny leaves bring a bit of fall into your stitching. You can frame your autumn embroidery in a hoop or enlarge it to make a pillow for the season. It would even make a beautiful center for a table runner. For this, you might skip the tiny leaves and adjust the size to fit within the autumn leaves wreath pattern. This is one design in a series of matching seasonal patterns, so grab the winter, spring and summer designs and start planning what would make a good seasonal set. Kitchen towels, for example, would be great. 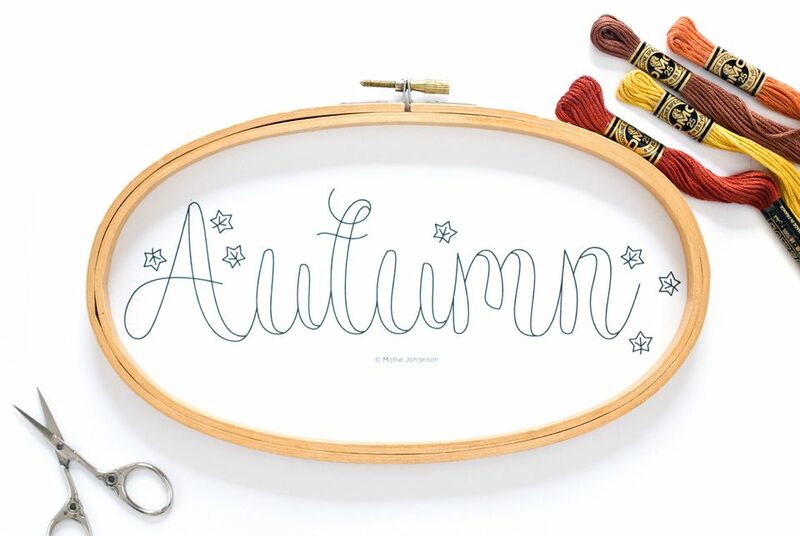 Grab your hoop and needle, and welcome autumn with your stitches! To use this pattern download the JPG file and print it with settings set to "fit to page." This will size the pattern to fit in a 5x9-inch oval hoop or a 9-inch standard hoop, while still keeping the leaves at a decent size. If you want to make this design smaller, shrink it down and stitch the word Autumn, then embroider leaves around it a size that is easier for you to stitch. Use your favorite method for transferring the pattern to your fabric. Note: This design is copyrighted Mollie Johanson. It may be used for stitching both personal and cottage-industry projects, but the pattern may not be resold. Choose a range of autumn colors for this pattern, such as burgundy, orange, golden yellow and brown. For a simpler, but more striking design, use bold colored fabric and a single contrasting color for the entire embroidery. One idea would be to stitch with golden yellow embroidery floss on brown fabric. For this, try marking the pattern with water-soluble stabilizer. Use three strands of floss throughout the design, unless you want very delicate leaves, in which case you should use one strand of floss. Embroider the wide areas on the lettering with basic satin stitch. Alternately, you could outline those areas and fill them another way. Or if you will be stitching this on a kitchen towel, which may get some wear and washing, long and short stitch will hold up better. For the thin lines on the lettering, use back stitch. If you'd like those lines a little thicker, you can add a second line of back stitch right next to the first or add the extra stitching to only certain parts of the line. Embroider the leaves with fly stitch, working each point as a tiny stitch. Or, if you'd rather, stitch the leaves with back stitch. Enjoy a new season of stitching!